•	The results obtained from the use of GRENA products are unparalleled in growth, amount, and taste. 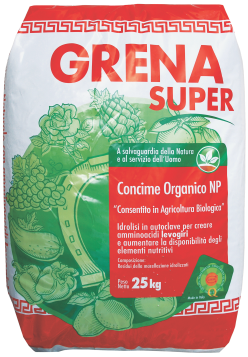 These are just five points, but they illustrate the strength of GRENA products; you can count on us for a range of products for a whole variety of crops. In particular, we want to draw your attention to our processing system. THP®, that is thermal hydrolysis, guarantees that no chemical element comes into contact with the organic matter as it is heated during production. The growth of the crop meets the GRENA product, tailored to your needs. Our organic fertilizers are ideal for fruit, vegetables, garden flowers and houseplants. Halfway between the earth and the sky, to serve man and safeguard nature. OUR FERTILIZERS ARE CERTIFIED BIO! Listed in the inputs lists for organic agriculture (FiBL, InfoXgen, IMO Control).